2016 was another busy year filled with awesome adventures and travel around our beloved Canadian Rockies. As I look back at my highlights from the year, what really stands out to me are the moments where we took time out to "play" as a family, the days where we embraced child-like wonder and fun, and the trips where we slowed down enough to do silly things, be it playing a game of tag on skates on a beautiful mountain lake or stopping to make snow angels in the backcountry when we really should have been hurrying to get back before dark. 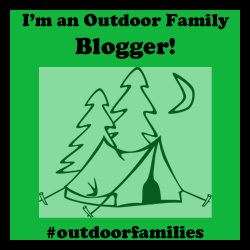 Between each member of the family (including a few solo trips my husband and I each took) we completed 14 wilderness and backcountry trips, staying in cabins, huts, hostels, and backcountry campgrounds. We hiked into a new backcountry cabin in Cypress Hills Provincial Park that we'd never been to before and we visited two Alpine Club of Canada backcountry huts for the first time as a family. I also got the opportunity of a lifetime to stay at the Lake O'Hara Lodge for a night while writing a story for Snowshoe Magazine and we got to try winter yurt-camping for the fist time at Mount Engadine Lodge in Kananaskis. We "relaxed" a little with "car camping" this year and only spent 21 nights in our trailer (one year we reached 40!) We focused more on backcountry trips this summer along with "comfy" trips where we stayed in wilderness hostels, condos, and vacation rentals. When we were camping in the front country, we tried to focus on camping in Alberta Provincial Park Campgrounds because I was chosen as an Alberta Parks Ambassador for this past season. I'm hoping the relationship continues in the coming year as we enjoyed visiting some new parks this past summer. Climbing mountains was a huge focus this past year, and by the end of October we had tackled (and successfully reached) 11 summits as a family. Noah is proud that he finally made it up to the platform on Lady Macdonald in Canmore, something he'd been wanting to do all summer, and I'm proud that he accomplished several multi-summit days including an epic 5-summit day where we traversed between Ha Ling Peak to Miner's Peak and the connecting three humps. Overall, this is the area where I feel my son truly shines in the mountains. 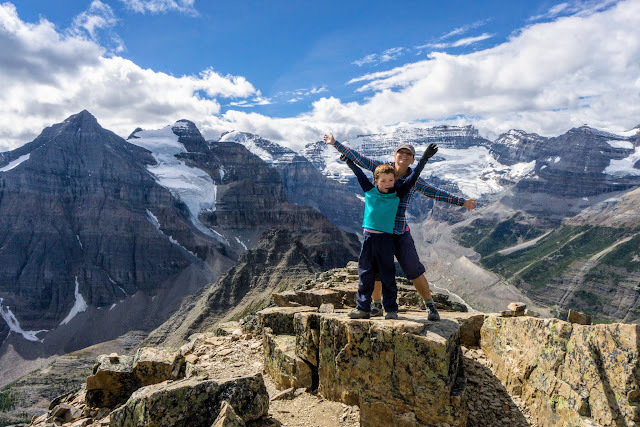 He was reaching height gains of 1100 metres by the end of the summer and never seemed to get tired, even after reaching the third summit on the long Tent Ridge traverse. By the end of the hikes I'd be exhausted and ready for bed whereas I'm sure Noah could have kept going for another hour or two. The kid is a machine when it comes to hiking and is definitely faster than me on the way down now. By next summer he'll be about as fast as me on the way up too. Noah also has zero fear of heights and tackled some pretty impressive ridge walks and summits for a 7 year old. For those trips we always brought Dad along and made sure there was a rope! The big accomplishment of the summer here was our 40 km ride on the Kettle Valley Rail Trail in BC from Chute Lake down to Penticton (in a day!) It helps that it was mostly downhill but it was still bumpy and loose in sections, and definitely not paved. We got to ride through the beautiful Little Tunnel and enjoyed much beach time after. All in all, mountain biking was one of our favourite things to do together as a family this year and Noah definitely out-bikes me. On our last ride over Thanksgiving I had to bail onto the "baby trail" and take an escape route back to the highway while my boys kept riding on the intermediate terrain that I was too scared to continue on. Next year will be truly scary! We also really enjoyed big bike tours this past summer. Two of them are mentioned below where we'd bike 20 km loops combining several fun trails around the Banff area. We did an overnight paddling trip on the Red Deer River in July and as per normal for Central Alberta in summer, severe thunderstorms were predicted over the weekend we planned to do the trip. (The previous time we paddled the Red Deer River a tornado was following us down river.) We decided we really didn't want to be camped on a river bank during an epic thunder storm and chose to set up a base camp at the half way mark instead (complete with our trailer.) In the end, it was a very wise decision and one heck of a nasty storm blew in that evening. I enjoyed my stand up paddleboard for another season and Noah continues to become quite the proficient paddler in his own kayak. The goal for next year: to get him a real kayak and possibly some lessons. 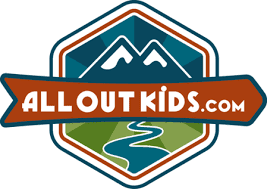 This category is newly added for 2016 because I have a child who can now climb a 5.7 or 5.8 route outside and who truly loves rock climbing (just like his dad!) I still show up to belay but at least I'm out with the family and everybody gets more climbs in with me happy to stay on the ground. We are very fortunate to have a great group of friends to climb with as well and so we spent a couple of family days at the crag rather than just driving out for short evening climbing nights. And of note, fall was warm enough that we were climbing outdoors in November this year instead of skiing! We did a few snowshoe-specific adventures this past year but we've really transitioned to being a ski-family much of the time, and enjoy both cross country along with downhill skiing. Last winter we took our first family ski trip to Fernie and I was thrilled to get Noah skiing with me on my favourite run in the entire Canadian Rockies. We also took our first family trip to Kimberley Alpine Resort, a ski hill that has always been my favourite, and it was an amazing weekend! Noah has really taken to cross country skiing as well and by the end of the 2016 winter season in March, he had skied over 140 km. (The goal was 100.) We celebrated a successful ski season by skiing in to the Elizabeth Parker Hut at Lake O'Hara over Easter where Noah skied the full 12 km in on his own steam. We also attempted our first family backcountry ski trip and it was awesome!! We had Noah hike up to Chester Lake in Kananaskis, while we carried his downhill skis and boots, and then he got to ski down. We towed him across the flats and I tried to survive on my skinny skis with metal edges and climbing skins. Lucky Dad had backcountry skis. I have a huge list of other backcountry trips we hope to do this coming year. 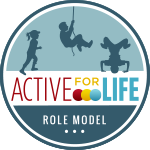 Many people don't realize that I had to have a hip replaced after my son was born and that technically I'm not supposed to do a lot of the stuff I do in the mountains, including downhill skiing. 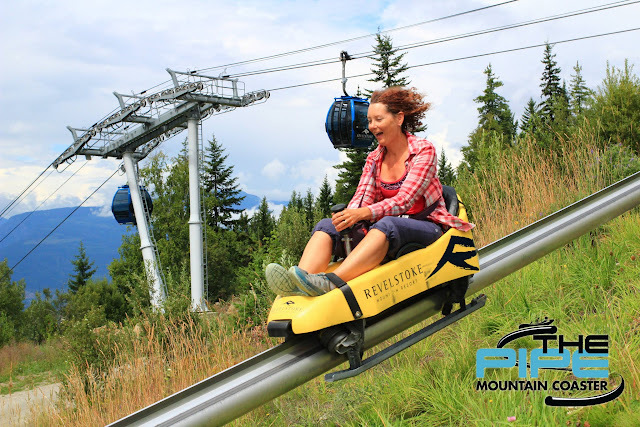 Add the fact that I've always found Fernie Alpine Resort to be a challenging resort, and that I hadn't done any skiing at a big ski hill since becoming a mom (7 years ago,) and I was terrified in the days leading up to our Fernie trip last January. The trip was empowering for me because I realized I could still ski intermediate groomed terrain, that I could ski solo with my son, and that my days on Falling Star were not over forever. It's always been my favourite ski run and I was thrilled to be flying down it with Noah at my side. I have two favourite cross country ski trails in the Lake Louise area that I like to do annually with my girlfriends. The first is Paradise Valley and the second is Boom Lake. I got to do both this year and we got to ski up the creek in Paradise Valley for the first time in many years because it was frozen enough. It's one of the most beautiful ski tours in the Lake Louise area and I was thrilled to introduce two of my girlfriends to this classic tour. I also enjoyed my annual ski across Boom Lake to the waterfalls at the far end of the lake. I'm hoping to do both tours as a family soon. This was one of those magical weekends where the skiing was incredible, family time was amazing, and the food magical. Noah truly came alive on his skis this weekend and he loved skiing through the trees in the special kids' area. I loved that I could comfortably ski runs off every chair lift and that I felt safe at this resort with all the lovely groomed corduroy. Finally, I'm still dreaming of the great food at the Pedal and Tap Restaurant that I hope to visit soon this coming winter. This is one of those trips that didn't start out well. We were supposed to ski into a backcountry cabin in this Southern Alberta provincial park, but there was no snow. We ended up hiking into the cabin on bare roads that we could have almost been biking. And then there was a controlled burn we had to hike through. (not ideal!) Our friends then had to leave a night early when one of their kids became sick. The redemption for this trip though came on the final day when we got to hike back to civilization on beautiful trails (as opposed to the roads we hiked in on) down to the Town of Elkwater, where our friends had parked our vehicle for us. We walked out of the bush and right into the town restaurant where I ate the biggest and best plate of chili cheese fires ever. We then got to try the town skating loop (a flooded campground loop) and the luge track (wicked fast and fun.) It was an awesome day full of simple pleasures that still stands out in my mind as a great day this past year. This was a notable trip because of the great friends that joined us at the Elizabeth Parker backcountry hut. We snowshoed and skied around the area, built the craziest luge track for sleds, built a giant snow fortress complete with tunnels and caves, and hunted for Easter eggs in the snow. It was a fun trip and we had a fabulous group of kids. Delayed gratification makes everything better and this was our second attempt to reach the south summit via an extremely narrow ridge walk. We short roped Noah to keep him alive should he fall and he was a champ with the hands on scrambling pitches. It was a super fun scramble and showed us he truly was ready for bigger challenges in the upcoming summer. There are actually several highlights from this vacation which means it was a pretty awesome two-week trip. 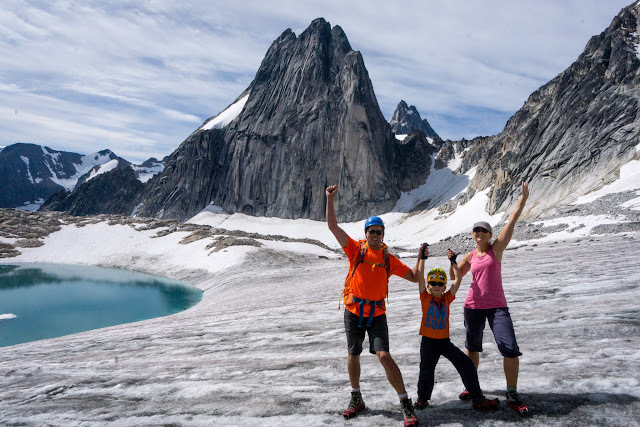 Backcountry Trip into the Bugaboos to stay at the Conrad Kain Alpine Club Hut. We also climbed Mount Fairview at Lake Louise with our visiting friends and added Saddle Mountain on for a two-summit day with 1100 metres of height gain. 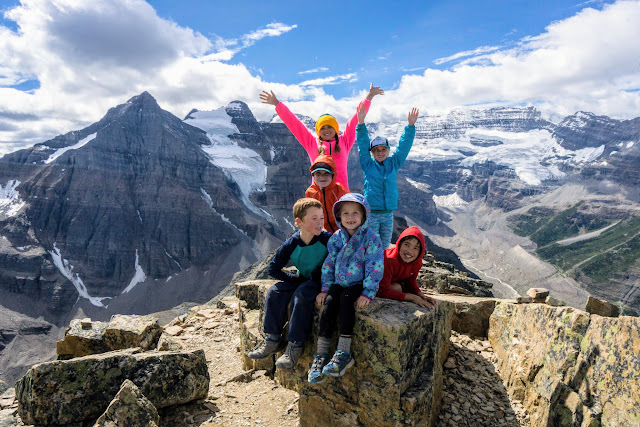 We had a third family joining us and it was another amazing day in the mountains.You can read about that trip here: First Summits: Mount Fairview and Saddle Mountain, Lake Louise. Yes, go figure, the first snow fall of the season would be a highlight, but we love snow! We were on our way home from a weekend at Lake Louise and decided to take a ride up the Banff Gondola to check out the recent renovations. The higher we got, the more snow there was until we got to the top and found ourselves in a winter wonderland. There was next to no snow on the ground so we were in awe that we could be on top of a mountain making snow angels in September. Normally we are lucky if Johnson Lake freezes and we get one skate in before snow covers the ice. This year, we not only got to skate on Johnson Lake but we also got to skate on Vermillion Lake and Lac Des Arcs for the first time. Both of those were on my life-skating list. 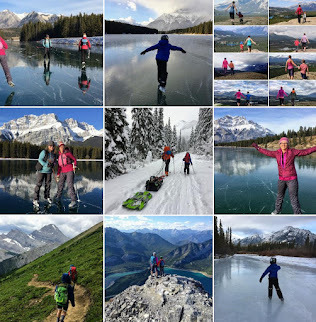 Add Elbow Lake in Kananaskis (where I carried my skates up to - just in case it was snow free,) along with Gap Lake and Grotto Pond in the Bow Valley, and it's been an amazing skating season! A couple of the special moments were playing skate-tag as a family on Johnson Lake (on a day that was absolutely perfect in every way,) and skating around the little island on Lac Des Arcs on ice that was as smooth as glass. Lac Des Arcs - Smooth as glass! So far we've skated on 8 different lakes or ponds this season (if you count the pond at Kananaskis Village and Bowness Pond in Calgary) and Noah is absolutely in love with skating! We've reached that magic stage where he's doing fairly well at skating, can move across the ice pretty quickly, and truly enjoys it. Thank God!! 2017 is going to be another awesome year and I hope you'll continue following our crazy family adventures. Happy New Year and expect Gotta do THIS January to be published in the first week of January. Happy New Year and we'll see you on the trails in 2017!